“What? There are 16 billion euros in cash scattered here and there, and we do not use them to load ATMs and make them work as normal?” Greek Prime Minister Alexis Tsipras told then finance minister Yanis Varoufakis in July 2015, according to the latter. In an excerpt from his book “Adults in the Room” to be published in Greece in September, Varoufakis recounts in detail conversations he had with Tsipras and other cabinet members after the imposition of capital controls on June 28, 2015. At the time, Athens was in acrimonious negotiations with creditors over the third bailout and the threat of bankruptcy and Grexit was looming large. The capital controls imposed by the government were allowing Greeks to withdraw 60 euros per day from their bank accounts. The 16 billion euros mentioned by Tsipras were funds of the European Central Bank. “I tried to hold back the prime minister, explaining to him that they could not take the money because their seizure would be theft,” Varoufakis recounts in his book. “But Yanis,” Alexis protested, “when my child is starving to death, and I do not have any money, I have the moral right to steal a carton of milk. Is this not a similar situation we live in?”. “Since when is theft considered a right for the Left?” I asked. Then (State Minister Alekos) Flambouraris rushed to defend his protegé. “We have every right,” he screamed, “to take that money and put an end to people’s suffering.” “We cannot seize the ECB money if we want to remain in the euro zone,” I replied, Varoufakis writes. “I’ll do it, Alexis,” I replied. This was the birth of the plan known as Plan X, which would only be implemented if and after Berlin and the ECB were implementing their own Plan Z that would push Greece off the cliff and towards a Grexit. Varoufakis also writes about the night of the July 15, 2015 referendum when almost 62% of Greeks said “No” to the creditors’ bailout program proposal. The former finance minister said that even though Tsipras was in favor of the “No”, Tsipras told him that he fears of a “coup d’état or even a new Goudi (the army barracks in Athens where court martial used to be held and traitors were executed in older days)”. 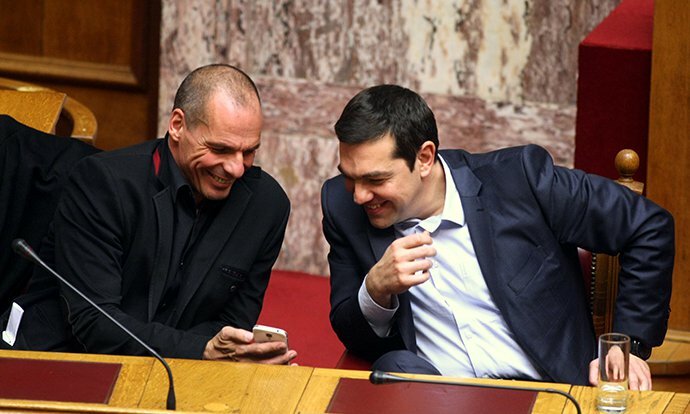 Varoufakis says that he had kept detailed notes of the conversations and also had recorded them with his mobile phone.